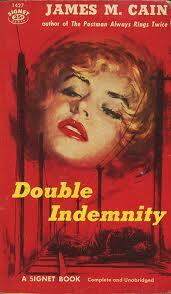 So I was a huge fan for the Raymond Chandler-penned screenplay first. James M. Cain’s novel is a taught, page-turning account of a man who went too far because he met a woman that he couldn’t say no to. Or maybe he just didn’t feel like saying no anymore. Double Indemnity is noir at its finest–drawing you in and leading you down a dark hallway of events that you never dreamed you would understand.